We’re pleased to share that Azure App Service and Functions are now generally available on Azure Stack. This release brings the power of Azure App Service and Azure Functions on-premises and offers support for customers running in multi-node environments. Azure App Service enables you to quickly build, deploy, and scale enterprise-grade web and API apps. Applications and services deployed on App Service can meet rigorous performance, scalability, and security requirements. Over the course of the last eighteen months, we have announced a number of technical previews of App Service on Azure Stack. With this release, you can now deploy your application in the environment of your choice with App Service, be it the public cloud, virtual network, or on-premises with Azure Stack. The Azure Stack support allows you to meet your specific regulation or edge computing needs, and provides you a flexible and unified approach to building and managing apps that can run in the cloud and on-premises. Whether you need to meet regulatory requirements or lack regular internet access (on cruise ships, for example) for your applications, Azure Stack extends the power of Azure to help you address these challenges. As a result, you don’t have to learn two different platforms, one for on-premises and another for cloud, to develop and manage your portfolio of applications. Even better, you will get all the high-productivity benefits, including continuous integration, continuous delivery, and deployment slots, that come with Azure App Service inside your own datacenter. We recognize that hybrid requirements are long term and durable for almost all of our enterprise customers, and are excited to continuously enhance our hybrid cloud portfolio by bringing App Service and Functions to more customers and use cases through Azure Stack. 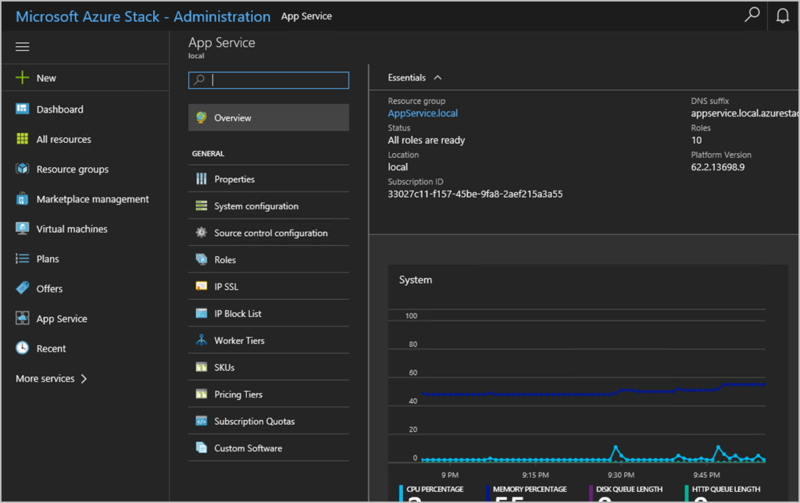 You can download Azure App Service and Functions on Azure Stack today. To find more information, check out this before you get started article. If you need any help using the Azure Stack Development Kit, start with the MSDN Forum.